The perfect healthy cookies for your little ones! The cool crisp air, pumpkin scented candles, changing leaves and Fall ingredients, such as apples, squash and pumpkin, are among the many things that make Autumn my favorite season. In this recipe, pumpkin is the star! I am always looking for creative ways to get my 3 year old to eat healthy foods, and what better way than to incorporate some healthy ingredients into a fun cookie! 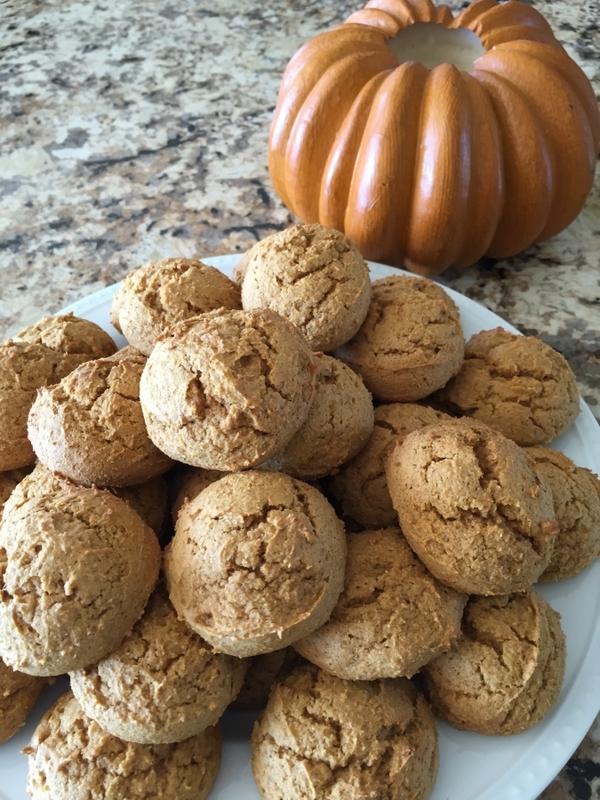 This recipe features whole wheat flour, pumpkin puree and pure maple syrup as a sweetener. Did you know that 1 cup of maple syrup contains important nutrients like calcium, manganese, iron and zinc, all important minerals for your immune system? So, skip the guilt trip as you and your family enjoy these delicious Fall treats. Top with the optional glaze to make them extra special! 1- Preheat oven to 350 degrees and line baking sheets with parchment paper. 2-Combine flours, baking soda, baking powder, cinnamon, nutmeg and salt in a medium bowl. 3-In a separate bowl beat sugar and butter until well blended. Beat in syrup, pumpkin, egg and vanilla until smooth. 4-Gradually beat flour mixture into wet ingredients. 5- Drop by rounded tablespoons onto cookie sheets. TIP- I used a small ice cream scoop so all the cookies were the same size. 6- Bake for 15 to 18 minutes or until edges are firm. Cool on baking sheets for a couple minutes and move to cooling racks. Combine 2 cups powdered sugar, 3 tbsp. milk, 1 tbsp melted butter and 1 tsp vanilla in a bowl. Drizzle on cooled cookies. Spring Vegetable Soup! Giving Thanks!